As the name implies the trail is found in waters that surround Galveston Island State Park. Because most of trails are protected by breakwater, the water is normally calm and makes for excellent paddling. Paddlers can choose from three different trails that vary in length from 2.6 to 4.8 miles. Because the park has many other features of interest, paddlers can also take a hike along the dunes on the Gulf side. Camping is available at the park if you chose to stay over, but make your reservations in advance since the park is often full during peak times. - Travel 9 miles to the flashing light on 3005, turn left into the park. - Travel 9 miles to the flashing light, turn left into the park. There are three different put-in/take-out points in the park for the three different trails. Paddlers can choose the Dana Cove, Oak Bayou or Jenkins Bayou Trails, depending upon the area or the distance they want to see. Each trail is a loop so no shuttles are needed. Each of the trails is on the portion of the park that is on the North side of FM 3005. The 2.6-mile Dana Cove (Lake Como) trail begins at the end of the main park road and continues through the seagrass beds that have recolonized behind constructed geo-textile breakwaters. The 4.8-mile Oak Bayou Trail is accessed along the main park road and also highlights the terrace restoration area, as well as areas of natural high marsh. The 2.8-mile Jenkins Bayou trail begins at the western end of Clapper Rail Road and takes paddlers along the bayou and out to the marsh restoration terrace field. 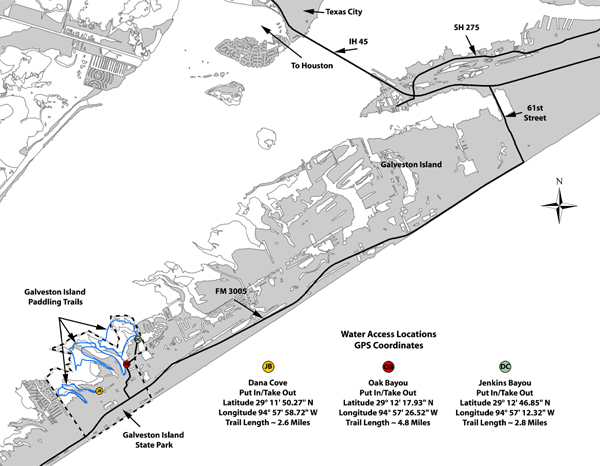 Road Map to Galveston Island State Park Paddling Trail - Click to view PDF (PDF 1.1 MB). 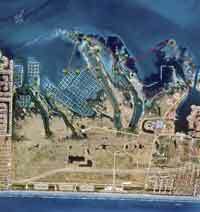 Color Satellite map of Galveston Island State Park Paddling Trail. Click to view PDF. (PDF 93.9 KB) This map is also available in a durable laminated version from select retailers. To get a list of these retailers contact Shoreline Publishing at 713-973-1627. This trail begins at Lake Como and meanders through the shallow water that is protected by a breakwater where seagrasses have recolonized. The trail crosses Dana Cove and returns to the put in — total length 2.6 miles. this 4.8 mile course trail begins near the boardwalk just off the main park road and follows an inlet of Galveston Bay. The trail meanders through shallow water out to the geotextile breakwater and over to the marsh restoration terraces where planted vegetation provides new habitat for small fish and shorebirds. The trail then enters another inlet and proceeds southeast, then turns at marker 16 and makes a look back to the put-in. Wear your lifejacket, and take plenty of sunscreen and insect repellant. Plan you trip to make sure you have plenty of water. While power boats traffic is minimal, always yield to faster moving vessels. The first know inhabitants of the area were the Karankawa Indians. They lived on the island and cruised the marshes in their dugout canoes alone, until the first explorers landed. Many people believe that Cabeza de Vaca landed on or near the island in approximately 1528. Legend has it that a number of pirates including Blackbeard and Captain Kid also used the island as a stopping point in the 1600’s. By the end of the Spanish rule of Texas, the Karankawa population had been greatly reduced by diseases and European invasion. Jean Lafitte and his brother Pierre Laffite took control of the island in 1817 and used it as a center for smuggling and piracy. In 1819 only three miles from the site of the park, Jean Lafitte’s men kidnapped a Karankawa woman and 300 Karankawa warriors retaliated, but were defeated by Lafitte and his men who had two cannons. This was a major defeat for the Karankawa who suffered heavy losses. In 1975 the 2,013-acre Galveston Island State Park was opened to the public. Anglers have several choices as to the type area to fish. Wade fishing is excellent in the fringes of the island or they may choose to fish in the newly created tiered restoration area where seagrass is re-colonizing. 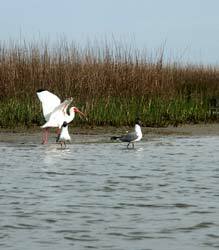 Common species include spotted seatrout, redfish, black drum, flounder and other species. The park administrative offices can be reached at 409-737-1222. The beach area’s sand dunes provide unique habitat and the park is home to wading and shore birds, mottled ducks and small mammals such as raccoons, armadillos, and marsh rabbits. The trail was established in cooperation with the U.S. Fish and Wildlife Service. 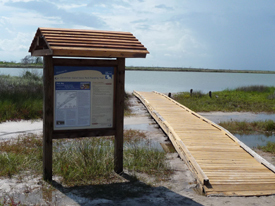 It is maintained in partnership with the Friends of Galveston Island State Park. 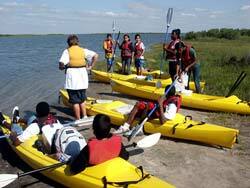 For more information on the paddling trails contact a member of our Friends group at (409) 737-5567. The park has supplies and trained kayak guides who can accommodate groups of up to 15 people on scheduled kayak tours. Access is on a first come first served basis, so if you are interested, please visit the park calendar for more information at http://tpwd.texas.gov/state-parks/galveston-island/park_events. Private tours and trips can be scheduled by contacting the park interpreter at by email.. Rent kayaks, canoes, paddles, and PFDs (personal flotation devices) 7 days a week at your nearest REI co-op.